In a world that's part paradise and part hell, two opposing tribes are divided by the most dangerous impulse of all: desire. For years, the Varekai and Elikai tribes have each struggled in their own ways to survive against the elements, hunger and the deadly creatures of Eden. For just as many years, they have adhered to one rule: never make contact. The resourceful Varekai are called female. And the Elikai? A mysterious, animal breed called male. When an adventurous Elikai brother is caught stealing from the enemy, a beautiful, inquisitive Varekai healer, the rules keeping the two tribes apart begin to matter less and less. Stranded together in a perilous land, a curious instinct draws Varekai and Elikai closer together than their world has ever dared. Warning: First Fall contains explicit content, including dubious consent. Zaide Bishop is a new-to-me author. There truly isn't a way to describe First Fall, so I'll do my best. Set in a futuristic, dystopian world, the Bones of Eden trilogy is a mix of the sexual innocence of Blue Lagoon, the divided brutality of Lord of the Flies, and the dystopian feel of The Maze Runner series and its ilk. Told in third person, from multiple points-of-view, First Fall features two tribes, divided by gender. Neither understands gender, thinking the other tribe another species entirely. The world-building leaves a lot of room for growth, but tells just enough to keep the reader riveted to the pages. As children, they were raised in separate parts of Eden, by 'teachers' who were overthrown when bad things happen. Toss in Jurassic Park creatures/experimentations to fill the landscape, and it adds another thrilling level to the storytelling. As the reader, I have no idea how old the cast of characters are, but it didn't matter. Their naiveté, lack of understanding of gender and breeding, is told in a way that the reader is also educated right alongside the characters. The storytelling had an addictive quality, and I found it more sensual/sexual/non-consensual than I expected it to be. I'd suggest against readers who are triggered by the aforementioned. But, as a lover of dark and twisty books, The Bones of Eden trilogy was exactly what I was looking for. At the end, I wished I had the next immediately and can't wait to sink my teeth into the next installment. 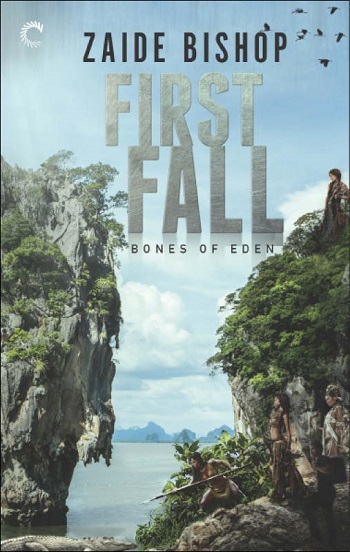 Reviewers on the Wicked Reads Review Team were provided a free copy of First Fall (Bones of Eden #1) by Zaide Bishop to read and review.